No sooner did meteorologists take note of a historically calm spring severe weather season, than three straight days of killer tornados raked across the South and Midwest. Beginning on Sunday, April 28th, 2014, a violent outbreak of severe weather killed more than 38 people in eight states, including fifteen reported deaths in Arkansas and twelve deaths in Mississippi. 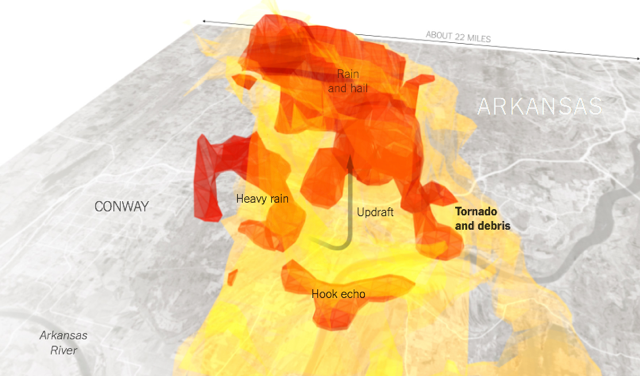 As part of their multimedia coverage,The New York Times gathered storm data from the National Oceanic and Atmospheric Administration (NOAA) and the Little Rock (Arkansas) National Weather Service Forecast Office and developed a series of informative maps as well as an interactive three-dimenional image of the storm. Radar returns from multiple ground stations cut through the towering cloud from several angles, allowing computers to create a 3D image. Readers can click and drag to get a sense of the shape, size and enormous impact of the deadly storm. This entry was posted on Friday, May 2nd, 2014 at 8:34 am and is filed under DATA VISUALIZATION, MULTIMEDIA EXAMPLES. You can follow any responses to this entry through the RSS 2.0 feed. Both comments and pings are currently closed.